June 28, 1997 - Months following the first brutal showdown between Holyfield and Tyson - the two are back at the Grand Garden Arena in Las Vegas. Evander "The Real Deal" Holyfield had been an underdog in that first fight with the odds against him 25:1. "Iron" Mike Tyson, the defending WBA heavyweight champion, had planned to capture a huge purse and move on to more riches. Instead, Holyfield demolished Tyson. No one could have predicted what happened in the rematch. Biographies of the two fighters, who had similar upbringings and were trained by personalities as intense as their own. Tyson and Holyfield's bids for Olympic Gold in the 1984 Games where the two met at training camp and sparred for the first time. Accounts from matches leading up to the historic fight, including Holyfield vs. Bowe and Tyson vs. Spinks. A detailed account of fight night, the near riot in the MGM Grand casino, what happened to Holyfield's chewed off ear and his own biting history. Celebrating the bout's 16-year anniversary in June 2013, Tyson and Holyfield are forever linked by the memorable fight. Generations recognize the bout as a landmark moment in both pop culture and sports history. The Bite Fight is a must-read look behind the scenes for all diehard boxing and sports fans alike. George Willis is an award-winning sports columnist for the New York Post and a former journalist with the New York Times, Newsday, and the Commercial Appeal in Memphis. A native of Las Cruces, New Mexico, he lives in New Jersey. 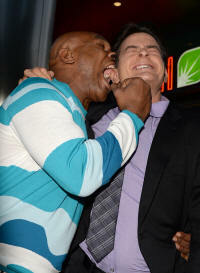 Kam interviewed Mike Tyson this past April one of the publicity still shows Mike pretending to bite actor Charlie Sheen on the ear. After watching the videos above, and reliving the memories, this does not seen funny at all. Look what the publisher was nice enough to share!